Tripp High School students Jim Uttecht, Dan Weber, Bob Maag and John Hirsch hatched the idea to form a band in the mid ‘60s. Weber drove to Mitchell and bought equipment for nearly $1,000 -- without his dad's permission. Uttecht bought a Kay guitar with strings so far above the frets that his left hand would nearly bleed with each practice. Luckily for the football team, it was his left hand. Jim was the Tripp quarterback and later coached West Central to multiple state titles. They practiced at Tripp City Hall, the Legion Hall and Fairland Ballroom and were never charged to use those facilities. They agreed on the Drifters until they heard the national group on the radio a few days later. To find a name, Tripp students submitted "Name the Band" entries on milk bottle caps from the local creamery. Winner: The Postmen. Saturday nights were big for business in Tripp. Stores would stay open until 10 p.m. Large crowds would buy their goods and gather on the streets. An old wooden pentagonal-shaped music stand occasionally featured grade school and high school bands on Saturday night. The Tripp Barbershop Quartet would sing their tunes. The Postmen were asked to play—finally performing before people. They played after movies at the Home Theater in Tripp and traveled as far as Parkston for some of their "Beach Blanket" movies. They were paid $40 in Parkston from the Alvero Theater. The owner of that movie house, Allan Schilling, also owned Island Park Ballroom in nearby Milltown. That relationship would be important to the band over the next few years. They started getting hired for high school functions, which meant they’d play in the game and then play the dance after the game. Many of The Postmen played their own proms. Not a popular decision for their prom dates, but who could pass up the $100? At a Junior Legion baseball game in Lesterville, the boys saw Mr. Maag’s 1965 brown and white Ford Fairlaine 500 pulling The Postmen trailer (painted the same color as the car) drive up near the field. Island Park's band had canceled and The Postmen were hired as the replacement! They had just hit the big time! 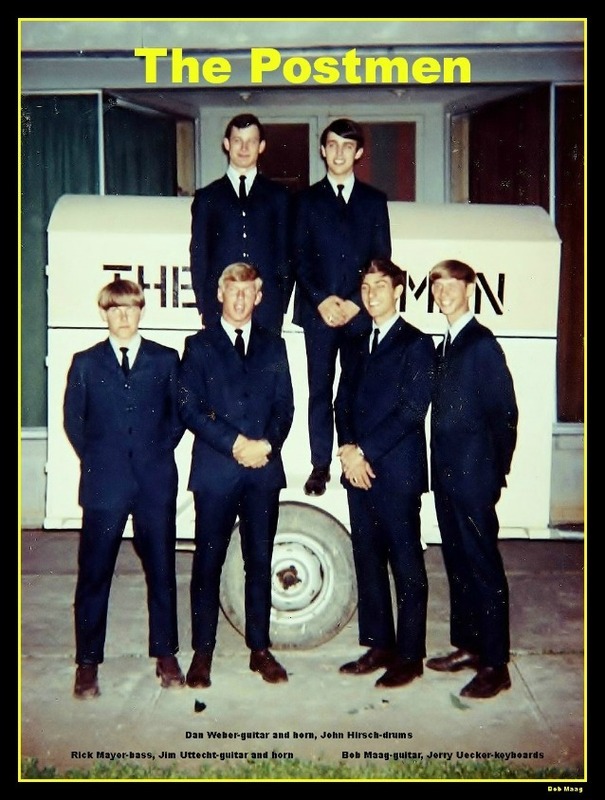 Rick Mayer started playing bass with The Postmen in 1966. Keyboardist Jerry Uecker also joined to make it a six-piece band. By late 1966, The Postmen played Island Park, Groveland Park, Rest Haven and Fairland ballrooms, along with the South Dakota State Fair. They also played Bonesteel, Fairfax, Willow Lake, Scotland, Menno, Tripp, Parkston and at Plano's last prom dance as the high school closed that next year. The Postmen played the Canistota street dance, one of the first street dances, and at Vic’s Place in Dimock, Yankton College and Dakota Wesleyan in Mitchell. To keep looking sharp, the band members visited Grigg's Clothing in Mitchell to buy matching stage clothes to keep up with their friendly rivals, The Tensions, from Tyndall. Four of six Postmen were members of the Emmaus Lutheran Church in Tripp, and all four came to Sunday church after a late Saturday night dance wearing their band outfits. On May 3, 1968, The Postmen played their last job. It was at Vic's Place in Dimock, where they always drew huge crowds. In the fall of 1968, Rick Mayer and Bob Maag went on to play with The Talismen.